I was thrilled and captivated by the triumphant return of the cult classic Twin Peaks after more than two decades off the air. 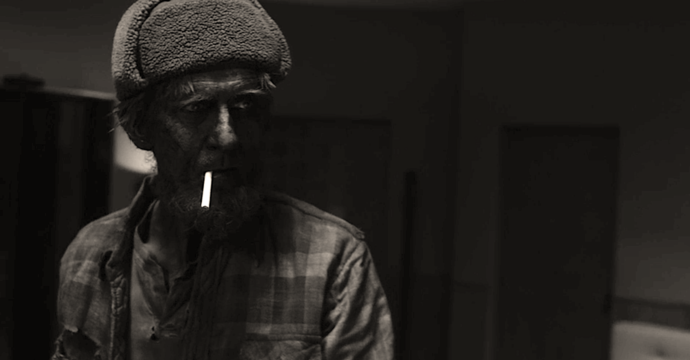 The most stunning and evocative episode is undoubtedly Part 8, which is an unfiltered trip into the nightmarish mindscapes of director David Lynch, beginning with the haunting appearance of the mysterious woodsmen, the fire-blackened creatures that are the topic of today's Pop Creature article. The episode alone is worth a watch for Lynch's masterful craft of surreal imagery and sound editing. The link above showcases one of the episode's most surreal moments, where we witness the birth of evil inside the atomic fire of a nuclear explosion. While Twin Peaks builds its lore and universe with dense episodes and leaves much open to interpretation, the enigmatic woodsmen and their origin shown in Part 8 in the fallout of an atomic bomb was prime territory for reverse-engineering into an RPG. Imagining the woodsmen as parasitic repercussions of magical or scientific catastrophes keeps their otherworldly menace. Even if you're not a die-hard fan of Twin Peaks these enigmatic creatures from a distant plane should prove to be a harrowing encounter for any Pathfinder group, and maybe a gateway into the decades-long soap opera mystery fever dream that is Twin Peaks. Take a look below to find out how these terrors translated to Pathfinder! A soot-covered human with a cigarette in its mouth lurches nearby, repeatedly murmuring to itself. Fear Aura (Su): Blast phantoms emit an aura of warped reality out to 20 feet. Creatures who end their turn in this aura must succeed at a Will save (DC 16) or be paralyzed. A creature may make a new save each round to resist this effect. Creatures who successfully save against a blast phantom's fear aura are immune to any blast phantom's fear aura for 24 hours. This is a mind-affecting fear effect. Save DCs are Charisma-based. Hypnotic Refrain (Su): At will as a full-round action, a blast phantom can speak a circular line of prose that clouds the mind. Creatures who can hear the blast phantom must succeed at a Will save (DC 16) or be fascinated as if by hypnotism, except it is treated as a language-dependent sonic mind-affecting compulsion. Creatures gain a cumulative +1 bonus to their save against this ability for every 10 feet of distance between the blast phantom and themselves. If the blast phantom is utilizing a means of remotely conveying their voice, such as project image, the additional source counts as the point of origin for this effect. Save DCs are Charisma-based. The save DC to resist this effect increases by 1 for every additional blast phantom that uses this ability and can also be heard. There is no limit on the number of hit dice a blast phantom may affect with this ability. No Language (Ex): A blast phantom can speak only to use its hypnotic refrain ability but is otherwise incapable of verbal communication. Shadow Transposition (Su): Five or more blast phantoms can work together to move a location from the material plane to the plane of shadow, or vice-versa. Performing shadow transposition requires each participating blast phantom be no more than 30 feet apart from one-another and concentrate for 1 minute. At the end of this duration, an area no larger than one 10-foot cube per blast phantom is shunted from one plane to the other. Shadow Traveler (Su): As a move action, a blast phantom can shift between the material plane and plane of shadow as though by plane shift. A blast phantom may take 1 additional creature per 2 Hit Dice with them using this ability. Unwilling creatures who succeed on a Will save (DC 16) resist this effect but do not prevent the blast phantom's movement. Save DCs are Charisma-based. Blast phantoms are malignant and parasitic extraplanar entities that feed off of the psychic energy associated with pain and suffering. Fortunately, blast phantoms are normally incapable of entering the material plane, but may slip through from their native realm in the aftermath of catastrophic energy-based events, such as an atomic blast or other supernatural upheaval. A typical blast phantom is 6 feet tall and weighs 180 lbs. Blast phantoms unconsciously take on a semblance of humanoid appearance when they enter the material plane. This appearance typically emulates the general appearance and style of dress for the region they first manifest in, subconsciously drawn from residual psychic impressions of the past. However, a blast phantom always appears sooty and burned regardless of their disguise. A blast phantom feed on negative emotions, most commonly pain and suffering, but also emotions such as fear. While a blast phantom is capable of feeding on such emotions within 60 feet, they do not require this subsistence to survive. Rather, the pain and suffering they feed on provides an addictive rush rather than any real sustenance. The native realm of blast phantoms is a little-understood energetic plane that may exist behind or parallel to the elemental planes. This dimension exists in a constant state of flux and change where clashing energetic forces collide, are destroyed, and are recreated in an instant. It is unknown in what form blast phantoms exist in this realm, save that they are not corporeal entities and may exist purely as some form of thought-based life. The boundary between this plane and other planes is not typically permeable, and the emergence of entities from this realm is as uncommon as it is apocalyptic. Blast phantoms enter the material plane through rifts created during extreme energy-based cataclysms, such as that created by a nuclear explosion or mythic magic. Only the most catastrophic of events can open a rift to their dimension, and some sages have postulated that their home plane may be a source of power for these very events. Since blast phantoms are not found in other places of naturally-occurring high energy, such as the plane of fire or within stars, it is believed that only unnatural events can breach their realm and the nature of the planes themselves are designed to otherwise prevent their incursion. Once blast phantoms manifest in the material plane, they are drawn to the latent psychic energy of humanoids and other sentient creatures. Blast phantoms are of singular purpose and will work alone or together to generate as much fear, pain, and suffering as possible to absorb those sensations. What blast phantoms do with that energy, or why they are attracted to it, is unknown. Nothing is known of blast phantoms' native society, if they even have such concepts. Blast phantoms are largely incapable of meaningful communication, and even those forced into the service of powerful spellcasters seem incapable of conveying complicated concepts. However, a blast phantom's inability to verbally communicate should not be construed as lack of intelligence. In truth, blast phantoms are cunning creatures capable of problem-solving, reasoning, and subterfuge. While they may be incapable of communication, they can forge alliances with other creatures when it suits their needs. Though the actual navigation of how such alliances are formed is not well understood. As blast phantoms are not native to the material plane, they have no natural habitat of their own and are invasive to any and all spaces. In spite of not being native to the plane of shadow, blast phantoms possess an unusual ability to travel between that plane and the material. Groups of blast phantoms working together can even move entire structures from the plane of shadow into the material, or open conduits from one material plane location to another using routes through the plane of shadow. These blast phantom warrens are typically rife with their kind and other evil outsiders or other extraplanar creatures. very grateful to know about pop creature,preview fiction and spotlight you have shared in your blog, great about art,aspects of axis,thanks for shaing with this. Interested post, thank for your sharing..